This product has been discontinued. See complete notification in Documentation tab. 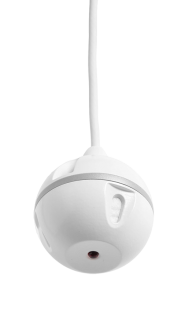 Includes the EasyUSB MicPOD I/O interface and two white EasyMIC Ceiling MicPODs. 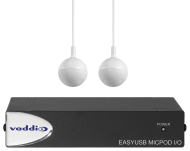 The EasyUSB MicPOD I/O interface is based on Vaddio’s™ SmartMIC technology, a simple and less expensive approach to adding live audio conferencing to room designs. As an interface between the EasyMIC microphones and any professional audio mixer, internal DSP and echo cancellation can now be integrated into any manufacturer’s audio mixing system. Each SmartMIC is equipped with an array of three electric condenser microphones positioned to form a 360-degree pickup pattern. This unique technology is based on the microphone’s ability to actively manage the room’s live audio for gain, gating and echo cancellation. Once detected, the microphone will adjust and mix down to a single output. Because the intelligence is inside the microphone, any mixer can now be used in a live collaboration application for audio conferencing and achieve outstanding results. 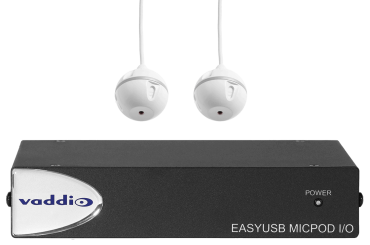 The EasyUSB MicPOD I/O interface device allows the connection of up to four SmartMICs and because each input is effectively running three microphones on three different channels, users can technically run 12 microphones all with independent echo cancellation and internal DSP. For installations requiring more than 12 SmartMICs, just add an additional EasyUSB MicPOD I/O for 12 more channels.